Many memorable moments were created throughout the duration of the games. With the end of the championship, the work and effort put in over the last few months by the entire contingent of Team Sunway finally came to fruition. Team Sunway emerged as the overall champions this year. They bagged 4 Gold, 1 Silver and 3 Bronze. 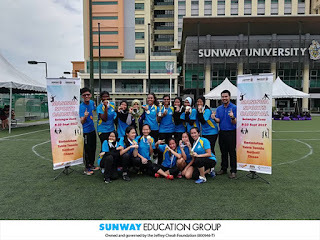 Sunway Sports Team would like to take this opportunity to express our gratitude to MASISWA Secretariat for their assistance and guidance given. Many thanks as well team manager’s cooperation and support from 21 institutions. Congratulations to all winners! Let’s meet and challenge again next year in MASISWA Sports Carnival Selangor Zone 2018!